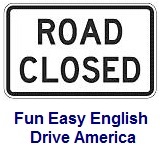 ﻿ Fun Easy English - Drive America - United States of America road signs, rules, and regulations guide, recreational information. Recreational and cultural interest area signs for general information provide information related to a specific area, basically telling you what you can and cannot do. Recreational and cultural interest area signs for educational purposes provide information related to a specific area which is new and may still be relatively unknown. Visitor information to the right.